A versatile artist and superb draftsman, Roelandt Savery painted flower pieces, still lifes and genre scenes. However, his landscapes—populated with all manner of flora and fauna and painted with a miniaturist’s attention to detail—earned him the admiration of artists and collectors. 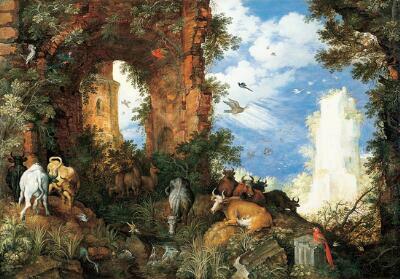 Landscape with Ruins and Animals presents a multifarious view divided in half by the looming arch on the left, and divided again into several detailed sections. The variety of objects and views prevents any single motif from dominating the picture. The entire composition is enlivened with highly detailed descriptions of animals, foliage, rocks and ruins. A landscape of ancient ruins and lush vegetation… exotic birds, wild and domesticated animals… a gleaming white tower, decayed and overgrown, silhouetted against a blue sky. This fantastical landscape by the Dutch artist Roelandt Savery is as intriguing as it as it is mystifying. Where is this magical place and what does it signify? Savery’s masterful still lifes and scenes of everyday life were admired by artists and patrons alike. Here, he depicts flora, fauna and architecture alike with a miniaturist’s love of detail. Just look at the tiny plants covering the forest floor… or the scarlet parrot resting on the broken column. On the left, two bulls are about to lock horns, as deer pass silently, almost camouflaged by rich foliage. The scene is full of surprises—at the upper right, for example, you’ll discover a monkey nestling in the branches. Yet, all this is woven together into an extraordinary tapestry of life—not a single element predominates. In the early 17th century, when this canvas was made, new vistas were opening through exploration, colonization, science, and technology. Advancements such as the microscope and telescope encouraged direct, first-hand study of nature. Even the newly accepted Copernican theory that the earth revolves around the sun contributed to the spirit of rational observation. Under these influences, a new style of art emerged—the Baroque. Full of movement and detail, Baroque art reflected a growing fascination with the outside world… both real and imagined.